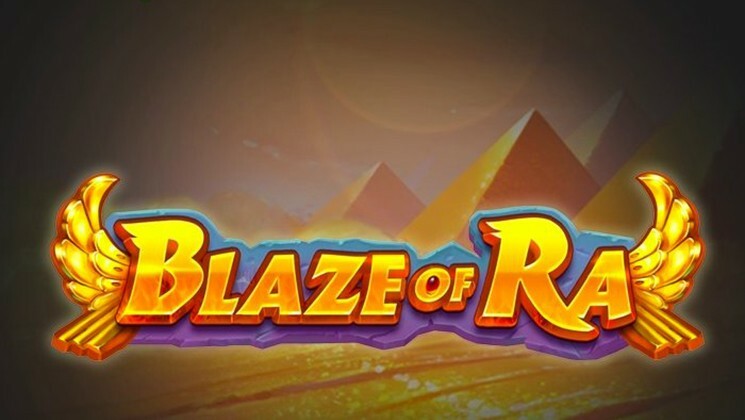 Blaze of Ra Slot is a five reel, four row and 40 paylines video slot provided by Push Gaming. Video slot takes its inspiration from ancient Egypt era, reels are set on the beautiful desert with pyramids background. Low value symbols goes from J’s to A’s playing cards, high value symbols are theme inspired the eye of Horus, ankh cross, sceptre hieroglyphs, the dog god Anubis and the cat god Bastet. 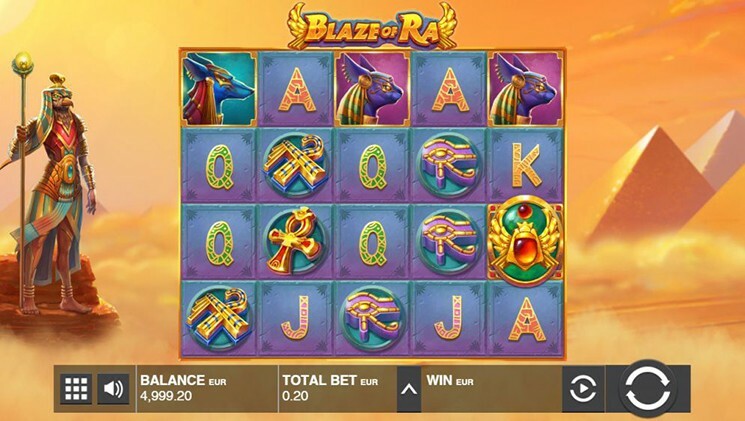 Before investing real money players can try Blaze of Ra Slot for free, or visit any Push Gaming casino such as: PlayGrand Casino, 7 Gods Casino, and others to play with real money and win. Before you join the adventure with the God of Sun, you need to place your bet. If you click small arrow button near the “Total Bet” you can adjust bet value which ranges from 0.20 to 100. Big button with two arrow is a “Spin” button and small button on left is a “Autoplay” button. In the lower left corner is a sound and settings buttons. God of Sun Ra is a Wild symbol which can be used as a substitute for any other symbol, except for Scatter. In addition Wild symbols can make their own winning combos. Scatter symbols is represented as a Scarab and if you land 3 or more of those symbols bonus feature will be activated. Each Scatter symbol will reveal number of Spins. Number of Free Spins you will be awarded is equal to sum of all numbers that Scarab symbols revealed. During this feature if other Scarab symbols appear you will be awarded with additional spins. Nudging Wilds feature is triggered as soon as Ra symbols appear in the top 2 symbol positions of one or more reels before the spin. Reels where are Ra symbols placed will go down by 2 positions whereas others reel will spin.